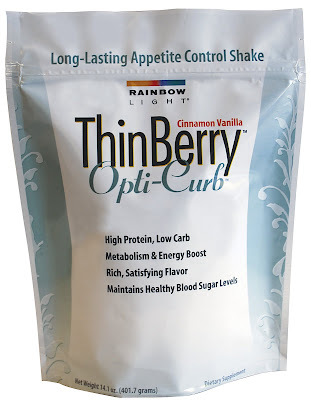 Last month I purchased Rainbow Light ThinBerry Opti-Curb Powder off of Amazon and went through the entire pouch in a couple weeks. I'd like to first note that although this is called "ThinBerry" and is clearly targeted towards weight control, my primary reason for purchasing this supplement was because of its high fiber and brown rice protein content. As a somewhat lazy vegetarian I don't always get as much protein as I would like, especially since I'm on this fitness kick and regurlarly working out. Although I'm neither a carb nor a calorie counter, I'm definitely guilty of not only having a super sweet tooth but also of continuous snacking. I was hoping that a quick shake might be a good way to supplement my protein intake, especially immediately following a workout. I was particularly drawn to this product because (1) It has very good reviews, (2) I use and like Rainbow Light vitamins; and (3) it does not contain gluten, soy, yeast, milk, eggs, or sugar. My first time making a shake I mixed the prescribed single scoop with about 10 ounces of milk. It was god awful. Everyone described the flavor as being "very cinnamon" but what they neglected to say is that it pretty much tasted like you were eating bark. Not pleasant. 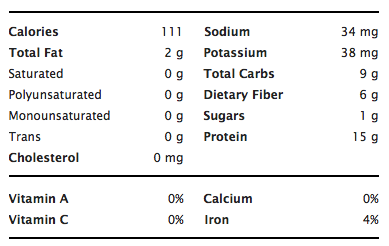 What was pleasant was the fact that it kept me full for quite sometime and, with the milk, was 15 grams of protein. My second time I mixed half a scoop of the Opti Curb with Tony's Chocolate BSN Syntha-6 Protein Powder (which was way higher in calories than my own powder, with a comparable amount of protein). The result was a pretty tasty shake, but one that had a much thinner consistency. I finally hit the jackpot combination: Light Chocolate Soy Milk plus a full scoop of the Opti-Curb. It was a very delicious, low calorie, high protein drink that I looked forward to every day, sometimes drinking it more than once a day. In conclusion - this stuff is pretty nasty on its own, but if you mix it with light chocolate almond or soy milk you get a delicious shake that's low in calories but super high in protein that keeps you full for at least a few hours. However, Opti-Curb is a bit pricey. If you have Amazon Prime (a brilliant and wonderful thing) and get it one sale, you're still paying over $1 per serving. While that isn't very much, compared to other protein powders it's rather expensive. For example, whereas Opti-Curb is $17 on sale for 14 ounces, Tony's Syntha is $28 for 2.9lbs! That's almost 46.5 ounces! Clearly there's a bit of a disconnect. For now I'm going to try other protein supplements, but I'll definitely keep this one in mind for future purchases.